Shazzer & Grubby report that the Jaina [banana] Republic is massively in debt to the Republic of China. Frankly Bananas has gone out of his way to KOWTOW to China. He does everything they wish and in return they make HIM look good. It is a one way relationship where China gets everything it wants for throwing the odd bauble to Dictator Bananas. They have given us less than 10% of the aid from Australia. They have given us a new Government IT Centre so they can monitor all Fiji Government activity. All the Construction and road building projects are funded by Chinese Soft Loans. What that means is that China pays for the projects but Fiji has to pay back the loan over 20 years at an interest rate of 3%. That sounds good until you look a bit closer. The projects are untendered. 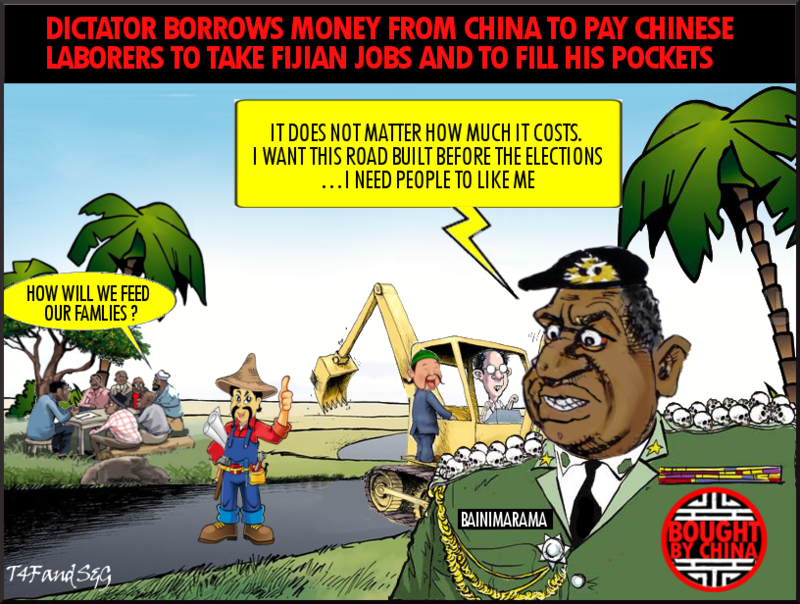 Fiji has to pay whatever the Chinese company says is the price. The Dreketi Highway is costing over $3m per km. The PWD used to charge $1m per km for similar work. So we have a debt of nearly $300m to build $100m worth of Road. The Chinese companies use Chinese labour, Chnese materials and Chinese machinery. So we are borrowing money from the Chinese to employ their people, to buy their materials and buy their machinery. The only economic benefit for Fiji is from the infrastructure improvement and some limited food sales because the Chinese laborers eat mainly rice from you guessed it China. Otherwise all the money goes back to China. Epidemics of Asian/Fijian babies along the routes of the roads as the Chinese laborers lay more than just roads. The Raiwaqa low cost apartments will cost over double the quoted price and even then will not be built to Fiji Construction standards. But again they have been built by Chinese laborers, materials and machines. Visa free entry to Fiji. The Chinese can come to Fiji without a visa. But Fijians still need a visa to go to China. We have seen an influx of Chinese coming into Fiji. Victoria Parade in Suva has become a China town with gambling dens and brothels operating under the noses of the police. We have seen what happens when Fishing Licences are issued to the Chinese and just ask the people of Bua how their fishing grounds have been affected by the Bauxite mining. But best of all we have not been told the true plans for Waila City? The Fijian people have been told that it is a development of low cost housing for Fijians. Not True. There will be 2,000 low cost units build but alongside 3,000 high value homes. The high value homes will come with Fijian Citizenship for overseas buyers primarily Asians looking to get away from pollution and overcrowding.